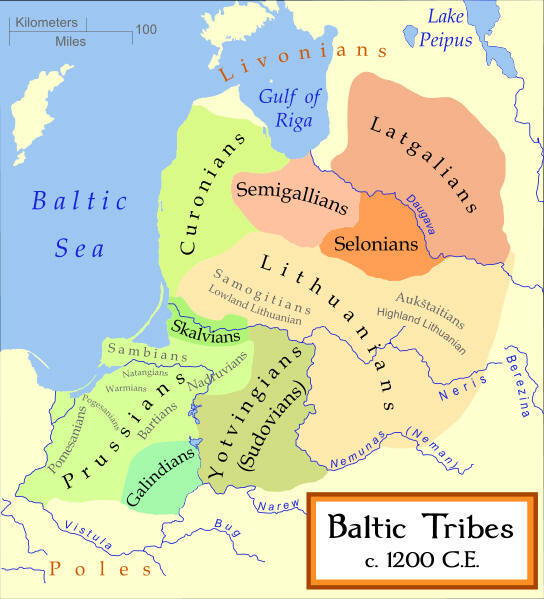 The Old Prussians or Baltic Prussians (German: Pruzzen or Prußen; Latin: Pruteni; Latvian: Prūši; Lithuanian: Prūsai; Polish: Prusowie) were an ethnic group, autochthonous Baltic tribes that inhabited Prussia, the lands of the southeastern Baltic Sea in the area around the Vistula and Curonian Lagoons. They spoke a language now known as Old Prussian and followed pagan Prussian mythology. Albert 1525-1568 Grandson of Albert III Achilles, Elector of Brandenburg of the House of Hohenzollern. Grand Master of the Teutonic Knights. Having become a Lutheran, received from the King of Poland the secular title of "Duke of Prussia". Albert Frederick 1568-1618 Son of Albert I.
John Sigismund 1618-1619 Elector of Brandenburg from 1608. Married Anna, Duchess of Prussia, daughter of Albert Frederick. George William 1619-1640 Son of John Sigismund and Anna. Frederick William 1640-1688 Son of George William. In 1657, Frederick William obtained from the King of Poland recognition of his complete sovereignty over the Duchy of Prussia, which thereby became an independent state, though Poland retained the right of reversion should the Hohenzollern dynasty die out. The relative rights of the Duke of Prussia and the King of Poland were established in a series of treaties that were renewed on each change of ruler, down to 1698 (accession of Augustus II of Poland). Frederick 1688-1701 Son of Frederick William. In 1701 he was crowned "King in Prussia", marking the complete independence of Prussia from all Polish ties, but limiting his sovereignty to the former territory of Ducal Prussia. Frederick I 1701–1713 Separated Prussia from Poland completely and assumed sovereign status as "King in Prussia" in 1701. Frederick William I 1713–1740 Son of Frederick I. Known as "the soldier king" (German: Der Soldatenkönig). Reformed the army and limited the state expenditure not related to the armed forces. Frederick II 1740–1786 Consequent on his annexation of Royal Prussia in the 1772 partition of Poland, Frederick the Great changed his title to "King of Prussia" rather than "King in Prussia". Frederick William II 1786–1797 Nephew of Frederick II. Augmented Prussian territory by further annexations of Polish lands. Frederick William III 1797–1840 Son of Frederick William II. With the dissolution of the Holy Roman Empire in 1806, he lost the title of Elector of Brandenburg, but was able to incorporate his territories in Brandenburg into the Kingdom of Prussia. Despite losses in the Napoleonic wars, at the Congress of Vienna Prussia's territory in Germany was greatly increased, making it the dominant power of northern Germany. Frederick William IV 1840–1861 Son of Frederick William III. During the revolutions of 1848-9, he was given the chance to become King of Germany, but turned down the offer. William I 1861–1888 Brother of preceding. Prussia annexed further territories as a result of the Second War of Schleswig in 1864 and the Austro-Prussian War of 1866, and became the dominant power in the North German Confederation. Following victory in the Franco-Prussian War, William I was proclaimed German Emperor in 1871, while retaining the title and powers of King of Prussia. Frederick III 1888 Son of preceding, Also German Emperor. Died after only 99 days from throat cancer. Hence the year 1888 is also known as Year of Three Emperors. William II 1888–1918 Son of preceding. The defeat of Germany in the First World War (1914) led William's abdication and exile and the fall of the House of Hohenzollern from power.